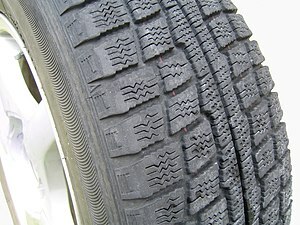 Winter tire, showing tread pattern designed to compact snow in the gaps. Snow tires—also called winter tires—are tires designed for use on snow and ice. Snow tires have a tread design with larger gaps than those on summer tires, increasing traction on snow and ice. Such tires that have passed a specific winter traction performance test are entitled to display a "Three-Peak Mountain Snow Flake" symbol on their sidewalls. Tires designed for winter conditions are optimized to drive at temperatures below 7 °C (45 °F). Some snow tires have metal or ceramic studs that protrude from the tire to increase traction on hard-packed snow or ice. Studs abrade dry pavement, causing dust and creating wear in the wheel path. Regulations that require the use of snow tires or permit the use of studs vary by country in Asia and Europe, and by state or province in North America. Related to snow tires are those with an M+S rating, which denotes an "all-season" capability—quieter on clear roads, but less capable on snow or ice than a winter tire. Snow tires operate on a variety of surfaces, including pavement (wet or dry), mud, ice, or snow. The tread design of snow tires is adapted primarily to allow penetration of the snow into the tread, where it compacts and provides resistance against slippage. The snow strength developed by compaction depends on the properties of the snow, which depend on its temperature and water content—wetter, warmer snow compacts better than dry, colder snow up to a point where the snow is so wet that it lubricates the tire-road interface. New and powder snow have densities of 0.1 to 0.3 g/cm3 (6 to 20 lb/cu ft). Compacted snow may have densities of 0.45 to 0.75 g/cm3 (28 to 47 lb/cu ft). Snow or ice-covered roadways present lower braking and cornering friction, compared to dry conditions. The roadway friction properties of snow, in particular, are a function of temperature. 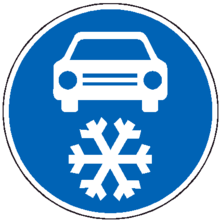 At temperatures below −7 °C (20 °F), snow crystals are harder and generate more friction as a tire passes over them than at warmer conditions with snow or ice on the road surface. However, as temperatures rise above −2 °C (28 °F), the presence of free water increasingly lubricates the snow or ice and diminishes tire friction. Hydrophilic rubber compounds help create friction in the presence of water or ice. Vehicle in cold, dry, powder snow, which offers comparatively better traction than moist snow. Vehicles in warm, moist, granular snow encounter decreased roadway traction. Snow tire with metal studs, which improve traction on icy surfaces. Additional siping, or thin slits in the rubber, that provide more biting edges and improve traction on wet or icy surfaces. Wet-film conditions on hard-compacted snow or ice require studs or chains. Many jurisdictions in Asia, Europe, and North America seasonally allow snow tires with metal or ceramic studs to improve grip on packed snow or ice. Such tires are prohibited in other jurisdictions or during warmer months because of the damage they may cause to road surfaces. The metal studs are fabricated by encapsulating a hard pin in a softer material base, sometimes called the jacket. The pin is often made of tungsten carbide, a very hard high performance ceramic. The softer base is the part that anchors the stud in the rubber of the tire. As the tire wears with use, the softer base wears so that its surface is at about the same level as the rubber, whereas the hard pin wears so that it continues to protrude from the tire. The pin should protrude at least 1 millimetre (0.04 in) for the tire to function properly. Snow tires do not eliminate skidding on ice and snow, but they greatly reduce risks. Studdable tires are manufactured with molded holes on the rubber tire tread. Usually, there are 80 to 100 molded holes per tire for stud insertion. The insertion is done by using a special tool that spreads the rubber hole so that a stud jacket can be inserted and the flange at the bottom of the jacket can be fitted nicely to the bottom of the hole. The metal studs come in specific heights to match the depths of the holes molded into the tire tread based on the tread depths. For this reason, stud metals can only be inserted when the tires have not been driven on. A proper stud insertion results in the metal jacket that is flush with the surface of the tire tread having only the pin part that protrudes. When studs come into contact with pavements they abrade the asphalt or concrete surface. This can result in creating polluting dust and wear in the wheel path that prevents proper drainage. For this reason, studded tires are banned, at least seasonally, in many jurisdictions. The compacted snow develops strength against slippage along a shear plane parallel to the contact area of the tire on the ground. At the same time, the bottom of the tire treads compress the snow on which they are bearing, also creating friction. The process of compacting snow within the treads requires it to be expelled in time for the tread to compact snow anew on the next rotation. The compaction/contact process works both in the direction of travel for propulsion and braking, but also laterally for cornering. The deeper the snow that the tire rolls through, the higher the resistance encountered by the tire, as it compacts the snow it encounters and plows some of it to either side. At some point on a given angle of uphill pitch, this resistance becomes greater than the resistance to slippage achieved by the tread's contact with the snow and the tires with power begin to slip and spin. Deeper snow means that climbing a hill without spinning the powered wheels becomes more difficult. However, the plowing/compaction effect aids in braking to the extent that it creates rolling resistance. 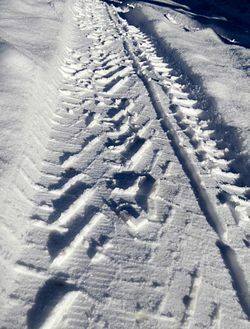 Compaction of snow under an advancing snow tire, causing rolling resistance while passing through about 10 centimetres (4 in) of snow. Compaction in about 5 centimetres (2 in) of snow left behind a snow tire, showing tread-snow interaction. ASTM International (American Society for Testing and Materials International) is an international standards organization that develops and publishes voluntary consensus technical standards for a wide range of materials, products, systems, and services. The pertinent standard for snow tires is ASTM F1805 – 16, Standard Test Method for Single Wheel Driving Traction in a Straight Line on Snow- and Ice-Covered Surfaces, which assess tire performance on snow and ice. It measures the traction of tires under acceleration in the rolling direction. Tires that pass this test are entitled to display the 3PMSF (Three-Peak Mountain Snow Flake) symbol. 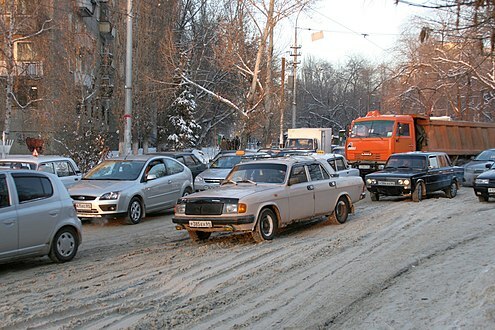 In Russia light vehicles and buses must be equipped with snow M+S or 3PMSF tires on all axles from December through February and have a minimum tread depth of 4 millimetres (0.2 in). All prefectures of Japan, except for the southernmost prefecture of Okinawa, require the motorized vehicles to be fitted with winter tires or tire chains if the road is icy or slushy. If tread grooves of snow tires are worn off for more than 50% of its original depth, tires must be replaced to meet the legal requirements. Drivers will be fined for failing to comply with the snow tire or tire chains requirements. Nationwide studded tire restrictions for passenger vehicles came in effect in April 1991, followed by restrictions for commercial trucks in 1993. Studded tires are technically still legal in Japan, but the usage is restricted by environmental law and it is a criminal offence to operate a vehicle fitted with studded tire on dry asphalt or concrete. As of 2016, European regulations pertaining to snow tires varied by country. The principal aspects of regulations were whether use was mandatory and whether studded tires were permitted. Studded tires warning sticker in Russia. Mandatory use – The following countries required snow tires between specified dates: Austria, Bosnia-Herzegovina, Croatia, Czech Republic, Estonia, Finland, Germany, Latvia, Lithuania, Montenegro, Norway, Serbia, Slovakia, Slovenia, Sweden, and Russia. Studded tires banned – The following countries banned the use of studded tires: Albania, Belgium, Bosnia-Herzegovina, Bulgaria, Croatia, Czech Republic, Germany, Hungary, Luxembourg, Macedonia, Montenegro, Netherlands, Poland, Portugal, Romania, Serbia, Slovakia, and Slovenia. Studded tires restricted – The following allowed the seasonally restricted use of studded tires: Austria, Denmark, Estonia, Finland, France, Great Britain, Iceland, Ireland, Latvia, Lithuania, Norway, Russia, Spain, Sweden, and Switzerland. The U.S. National Highway Traffic Safety Administration (NHTSA) and Transport Canada allow display of a 3PMSF symbol to indicate that the tire has exceeded the industry requirement from a reference (non-snow) tire. As of 2016, snow tires were 3.6% of the US market and 35% of the Canadian market. British Columbia – Snow tires are only required by law in certain "designated winter tire & chain-up routes" in mountainous regions. In these areas, motorists must use winter tires or carry tire chains. Alberta – Banff National Park or Jasper National Park require cars to have snow tires or tire chains between November 1 to March 31, or any other period during which the road is covered with snow or ice. 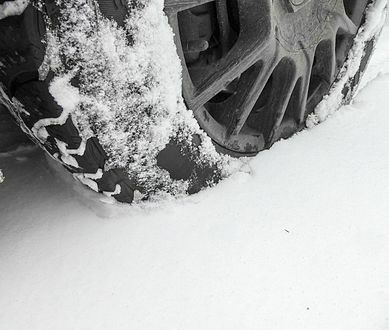 Quebec – Winter tires or studded tires must be used from December 15 to March 15. Prohibited – Studded snow tires may not be used in Hawaii, Mississippi or Puerto Rico. Seasonal use – All other states and provinces allow seasonal use of studded snow tires. In Alabama, Florida, Louisiana, Michigan and Texas, only rubber studs are allowed. ^ Heißing, Bernd; Ersoy, Metin (2010). Chassis Handbook: Fundamentals, Driving Dynamics, Components, Mechatronics, Perspectives. Springer Science & Business Media. p. 591. ISBN 9783834897893. ^ "Prall Tester - Studded Tyre Wear Test". www.cooper.co.uk. Cooper Research Technology Ltd. Retrieved 1 September 2014. ^ Newton, Richard (2007). Wheel and Tire Performance Handbook. St. Paul: MotorBooks International. p. 35. ISBN 9781610592512. ^ a b c Hays, Donald (2013). The Physics of Tire Traction: Theory and Experiment. Springer Science & Business Media. p. 428. ISBN 9781475713701. Retrieved 2016-12-25. ^ ScienceDaily (6 January 2011). "How Studded Winter Tires May Damage Public Health, as Well as Pavement". Retrieved 26 January 2011. ^ "Studded Tires for Winter Driving". Tirerack.com. Retrieved 24 January 2015. ^ "Studded Tyre Wear Test". www.cooper.co.uk. Cooper Research Technology Limited. Retrieved 3 September 2014. ^ US Army, Stuttgart. "Winter Tire Rules" (PDF). stuttgart.army.mil. US Army. Retrieved 2017-03-29. ^ Subcommittee: F09.20 (2016). "ASTM F1805 – 16: Standard Test Method for Single Wheel Driving Traction in a Straight Line on Snow- and Ice-Covered Surfaces". ASTM Book of Standards. 9.02: 14. doi:10.1520/F1805-16. Retrieved 2017-03-26. ^ Department of Transportation (2007). §571.139 Standard 139 – New pneumatic radial tires for light vehicles. Title 49. Washington, DC: Office of Federal Register. p. 505. ISBN 9781577857778. ^ a b Editors (2016). "Winter Regulations—European regulations for winter equipment on trucks and buses". continental-tires.com. Continental Tires. Retrieved 2017-03-26. ^ Editors (January 16, 2015). "Snow Tires on Your Car: Not Just a Necessity But Sometimes a Law". 1816 – The Magazine. Remington. ^ a b e-Gov Laws and Regulations Database (June 27, 1990). "The Act on Prevention of the Generation of Spike Tire Dust (Act No. 55)". law.e-gov.go.jp/htmldata/H02/H02HO055.html. Government of Japan. ^ "Winter tyres legislation in Europe - An overview of the regulations | Uniroyal". www.uniroyal-tyres.com. Retrieved 2018-07-23. ^ Brimborg ehf. (2017-12-10). "Winter driving in Iceland on winter tyres". Dollar Rent-a-Car Iceland. ^ Editors (February 21, 2017). "Cooper Recalls 7,067 Discoverer M+S Sport Tires". moderntiredealer.com. Modern Tire Dealer. Retrieved 2017-03-26. ^ Editors. "What You Should Know—Tires for Winter Driving". tracanada.ca. Tire and Rubber Association of Canada. Retrieved 2017-03-26. ^ Dudley, David (6 December 2016). "The Joy and Terror of Urban Snow Driving". CityLab. Retrieved 13 December 2016. ^ Editors (2017). "Legislation for Snow Tires in the USA". bartecusa.com. Bartec USA LLC. Retrieved 2017-03-26. ^ Editors (2017). "Legislation for Snow Tires in Canada". bartecusa.com. Bartec USA LLC. Retrieved 2017-03-26. ^ TranBC (2017). "Designated Winter Tire & Chain-up Routes". gov.bc.ca. Transport British Columbia. Archived from the original on 2017-03-27. Retrieved 2017-03-26. ^ Editors (March 23, 2017). "National Parks Highway Traffic Regulations". justice.gc.ca. Government of Canada. Retrieved 2017-03-26. ^ Editors (November 3, 2015). "Quebec winter tires mandatory as of Dec. 15". cbc.ca. CBC News. Retrieved 2017-03-26. ^ AAA (2017). "Digest of Motor Laws—Studded tires". AAA.com. American Automobile Association. Retrieved 2017-03-26.